While going through the drive-through at Starbucks, on an early morning before work, I’ve been torn between ordering a latte or a cappuccino. The latte is often too weak; the cappuccino not hefty enough. Neither seems to fully satisfy. The Starbucks® Flat White is an espresso beverage made with two ristretto shots, combined with a thin layer of velvety steamed whole milk and finished with a latte art dot. A ristretto shot delivers a sweeter, more intense coffee flavor. Starbucks baristas perfectly steam milk into creamy micro-foam and carefully free pour to allow the espresso to rise to the top of the beverage for a bold coffee flavor with a sweeter finish. 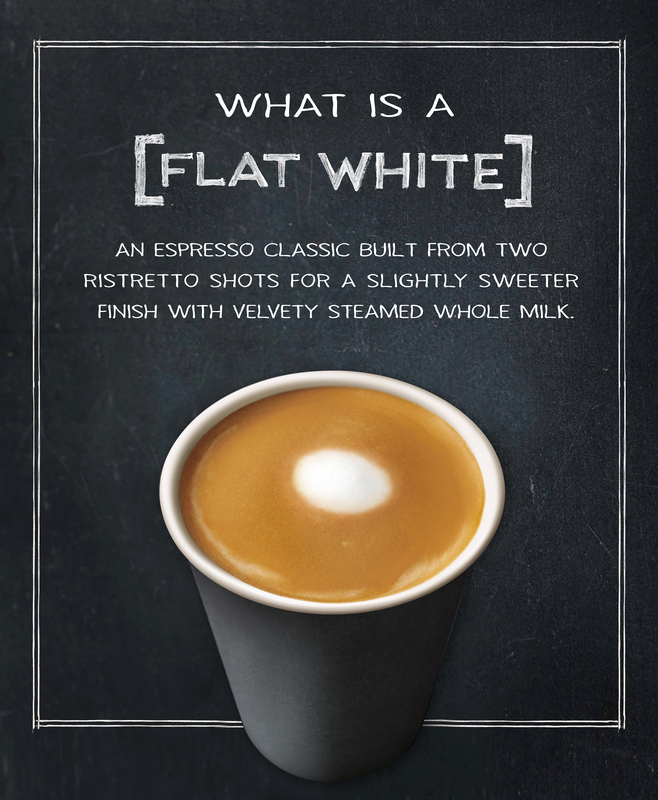 The Starbucks® Flat White joins the core menu line-up of espresso beverages like Caffé Americano, Caffé Latte, Cappuccino, Doppio Espresso and Espresso Macchiato. So, I’m just sayin’ what I order now, and will order forever more. Perhaps you’ll like it, too. For Xmas I got a coffee grinder, & an Aeropress coffee maker, now make coffee to suit my own taste buds, although I don’t always grind my own but the Aeropress makes coffee with pre ground is almost as quick as instant but a lot tastier. THIS is what I’ve been looking for! Yay! A nice way to start a day or a book. Keep warm. I don’t go to Starbucks all that often (I like my Nespresso!) but this sounds just perfect. When I try one, I’ll drink a toast to you! I actually tried this earlier this week! Usually I order (plain) coffee or tea at Starbucks, but I tried this after I was told that they didn’t add any sweetener. It is very nice. I’m a whipped cream and sprinkles type person, generally speaking, but this does sound delicious. Oooo I had no idea! Thanks for sharing darling. I usually order an Americano, but this sounds lovely. I’ll try one today. Thanks for the recommendation!